Wednesday October 30th 1901 It was a pleasant day and when not busy with the meals I spread paint all day. was very tired The boys are husking corn and Will busy about the place. Thursday October 31st 1901 We did churning and baking today and I painted some. The carpenter was here part of the day. Jack Pointer fixed part of the windows. I went to town for some things and Mollie went with me after school. Will was down to the store and the young folks out so Mollie and I had the evening alone. Frank began [illegible] taken Dells brothers place as he has a lame hand. 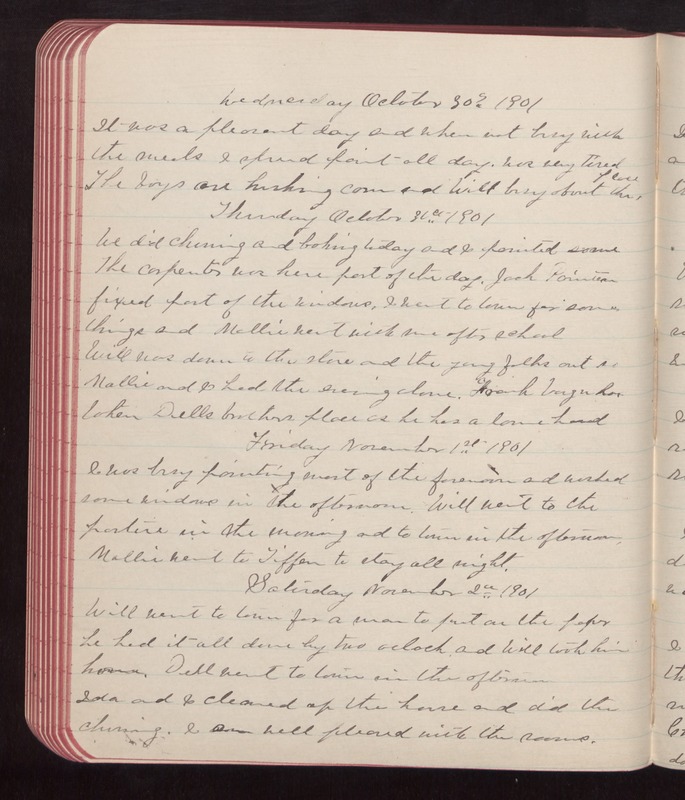 Friday November 1st 1901 I was busy painting most of the forenoon and washed some windows in the afternoon. Will went to the pasture in the morning and to town in the afternoon. Mollie went to Tiffen to stay all night. Saturday November 2nd 1901 Will went to town for a man to put on the paper he had it all done by two oclock and Will took him home. Dell went to town in the afternoon. Ida and I cleaned up the house and did the churning. I am well pleased with the rooms.